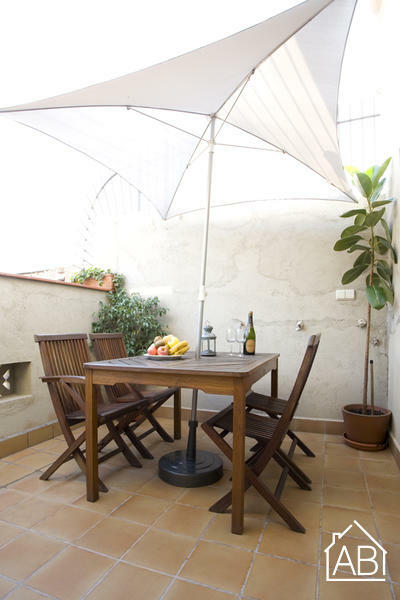 This lovely one-bedroom apartment in Barcelona located in El Raval, is the ideal choice for your trip to the Catalan capital. The neighborhood is an up-and-coming epicenter offering guests a chance to explore the latest trends, hippest art scene and the chicest night life. This apartment is the perfect choice for couples or families and can accommodate up to four people. The apartment enjoys a mix between modern and traditional, allowing you the best of both worlds. The living room has a comfortable double sofa bed and a TV with satellite, perfect for relaxing after a day of sightseeing. Large sliding doors, which allow for natural light to fill the space throughout the day, opens up onto a balcony. An Internet connection can also be found at this apartment, making it easy to stay in touch with friends and family back home. The kitchen is well equipped with plenty of the utensils and appliances needed to prepare your very own home-cooked meal, which you can enjoy, al fresco, on the balcony. The bedroom has two comfortable single beds, and ample storage space to make this the perfect home-away-from-home. The apartment has one bathroom with a walk-in shower. Geen Geen Teatre del Liceu 0,1 km0,1 mi / 1 min. Teatre del Liceu 0,1 km0,1 mi / 1 min. Mercat de la boqueria 0,5 km0,3 mi / 6 min. Mercat de la boqueria 0,5 km0,3 mi / 6 min. Plaza Cataluña 1,0 km0,6 mi / 12 min. MACBA 1,0 km0,6 mi / 13 min. MACBA 1,0 km0,6 mi / 13 min. Santa Maria del Mar 1,0 km0,6 mi / 13 min. Santa Maria del Mar 1,0 km0,6 mi / 13 min. Plaza Cataluña 1,1 km0,7 mi / 11 min. Palau de la Música 1,1 km0,7 mi / 14 min. Plaza Universitat 1,3 km0,8 mi / 17 min. Estació de França 1,4 km0,9 mi / 18 min. Plaza Universitat 1,5 km0,9 mi / 16 min. Palau de la Música 1,5 km1 mi / 17 min. Casa Batlló 1,6 km1 mi / 10 min. Parc de la Ciutadella 1,7 km1,1 mi / 21 min. Parc de la Ciutadella 1,7 km1,1 mi / 21 min. Casa Batlló 1,7 km1,1 mi / 22 min. Estació de França 1,9 km1,2 mi / 21 min. Arco de triumfo 1,9 km1,2 mi / 23 min. La Pedrera 2,2 km1,4 mi / 29 min. Arco de triumfo 2,2 km1,4 mi / 18 min. Plaza España 2,3 km1,4 mi / 29 min. Parque de Montjuïc 2,4 km1,5 mi / 37 min. Font màgica de Montjuïc 2,4 km1,5 mi / 31 min. La Pedrera 2,5 km1,5 mi / 14 min. Parque de Montjuïc 2,6 km1,6 mi / 39 min. Plaza España 3,1 km1,9 mi / 16 min. Torre Agbar 3,3 km2,1 mi / 41 min. Estació de Sants 3,4 km2,1 mi / 43 min. Sagrada Familia 3,5 km2,2 mi / 45 min. Font màgica de Montjuïc 3,5 km2,2 mi / 21 min. Torre Agbar 3,8 km2,4 mi / 25 min. Sagrada Familia 4,2 km2,6 mi / 22 min. Estació de Sants 4,4 km2,7 mi / 20 min. Camp Nou 5,1 km3,2 mi / 1 uur 5 min. Parc Güell 5,1 km3,2 mi / 1 uur 11 min. Parc Güell 5,4 km3,4 mi / 32 min. Fòrum 5,9 km3,7 mi / 1 uur 14 min. Fòrum 7,5 km4,7 mi / 44 min. Tibidabo 9,3 km5,8 mi / 2 uur 17 min. Tibidabo 10,3 km6,4 mi / 1 uur 9 min.